It is a sad day for all of the hockey community in Biscuit. At the age of 40 - rated 95 overall - Artem Bublik has announced his retirement. He has arguably been the best goalie in the world, having a save percentage of .90 or better every single season since the world started. Bublik broke in to the league at the age of 26 during season 1. He was criticized due to his small size, but right from the start he showed the doubters that his size was actually part of what made him so great. His athleticism was out of this world and his reflexes were some of the best we've seen, even during his old days. He might have been bit of a lone wolf, but aren't all goalies a little twisted, he was still loved by his team mates who will be sad to see him go. *These stats don't include season one. Although some say his age began to show during this last season and he couldn't play more than 1 game in a row, he is still going to be missed by the fans of Breakouts, and for sure the rest of the hockey community here in Biscuit. When asked about his retirement plans he told us he was going back to Ukraine and start his own goalie camp there, who knows if we'll see more Ukrainian superstars in the future! Thank you Artem Bublik and may the pucks be ever in your glove! I will always remember him for scoffing at me when I checked to see what he wanted for a salary as a free agent before season 14. Yup, Bublik was insanely good... I acquired him by luck. He asked French Gulch Black Knights (after winning cup there in S2) insane money to resign, so he went to FA and I got him for much more reasonable salary... the salary got higher with each season and more cups, but we managed to afford him and he worked hard for every dollar. 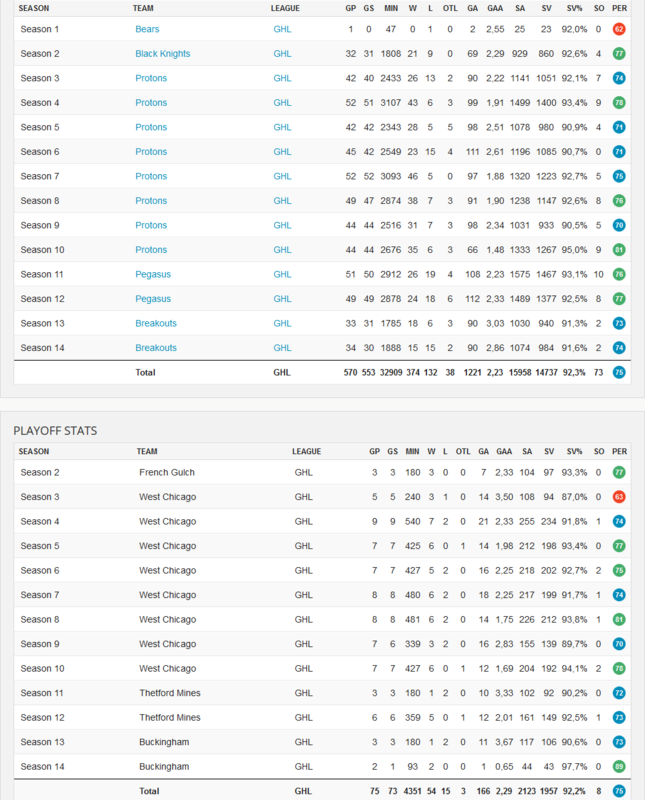 His number of shutouts is insane and he got us all 5 cups / so you can correct that he has 6 cups and he was in the GHL finals for 9 times including 7 in a row. But in S10 the salary demands started to increase again and our cap situation was too tight, so he went to FA once again. And we didn't win any cup since then. I got him after you. He stayed with me untill kiovola was 100% ready. He had 10 Shutouts. A personel record for him. He will be missed. Glad he retired before losing skill.